At the beginning of this year, Tzu Chi Foundation held the winter aid distribution at 44 places all over Taiwan. This continued a nearly 50-year tradition that began on February 9, 1969, when the first winter distribution was held in the eastern city of Hualien, where the foundation is based. Volunteers prepared the reunion banquet for families who receive aid from the foundation, the old and those in need. Volunteers also prepared 'blessing and wisdom' packs which were full of items for the Chinese New Year and daily necessities to help the recipients through the winter. On January 23, there were six distributions held in Taipei and New Taipei city. Mr. Hsu Li-Min, head of Department of Social Welfare, Taipei City Government, attended the event in Taipei eastern district. In a speech, he expressed that under the leadership of Master Cheng Yen, volunteer's works all over Taiwan has become something which those in need can rely on and a source of warmth and support for the society. "I greatly thank the brothers and sisters of Tzu Chi for their giving without asking in return. "he said. Hsu said that, when the Formosa Park accident happened in New Taipei City last June, Tzu Chi volunteers went at once to the disaster site to comfort the wounded and those in distress. "Up to today, volunteers do not cease the concerns. I admire their care for society." Moved by Tzu Chi's selfless contribution, director Hsu began to learn of Tzu Chi and took part in its activities. Hsu believed that Tzu Chi's charity work carried out in a complete way, especially its meticulous organization of volunteer teams spread all over Taiwan to create a network of care. 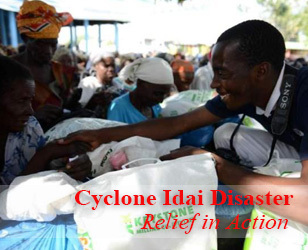 When disasters occur, they can provide immediate help. "There is much which we government can learn from Tzu Chi." he said. In the event, Tzu Chi volunteers provided varieties of services. One is a 'Health Care Area'; they invited medical personnel from Tzu Chi International Medical Association (TIMA) to provide free medical treatment, which took care of the recipient's body and spirit, comforted the poor and the sick to cure their illness and pain in their heart. Charity and medicine together treated the recipients. This not only involved the treatment and medication to deal with illness, which enabled the recipients to have an accurate understanding of the treatment. The doctors and nurses could also discuss with the volunteers how to provide even better medical care to the recipients. Another is 'Hair Salon', where hairdressers volunteered cutting, washing and perming of hair for the recipients and the members of needy families to look best during the New Year holiday. The 'Still Thoughts and Good Words Area' is a place for volunteers to write spring couplets and create a joyful and warm New Year atmosphere. The 'Clean Food Area' showed inventive vegetarian food and promoted vegetarianism to reduce the carbon footprint. 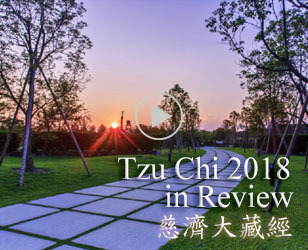 During the activities, the volunteers showed a film entitled "Tzu Chi 2015 Year in Review", the charitable work of volunteers worldwide spreading great love around Taiwan and overseas. The video also showed Master's blessings to everyone. And volunteers led everyone to hold a lamp of the heart to pray devoutly and harness the power of good for a world without disasters. This year Tzu Chi distributed more than 20,000 'blessing and wisdom' packs. Each was been packed with love and care by volunteers. Through distribution, they showed the attentiveness for the recipients, with the hope that the needy families feel the sunlight and find the courage to escape from the low point in their life. In addition, some recipient families who live in Kinmen island district and other remote places could not attend the distributions. There the volunteers delivered the packs and the blessings of Tzu Chi members around the world to their homes to provide a warm care. Tzu Chi volunteers treat the recipients with care and respect as principles. The recipients feel being treated with dignity and thus, the seed of love would be planted in their hearts. This will allow them one day to become a giver and help those who need it more than they do; this creates a 'virtuous circle' in society. Even though the winter brought coldness but love warms people's hearts. Tzu Chi volunteers devote themselves with compassion and the spirit of a Bodhisattva. They help those who are suffering and in difficulty. Through the gift of fine material goods for the New Year, the recipients feel comfort in their body and in their heart, bringing them endless happiness. 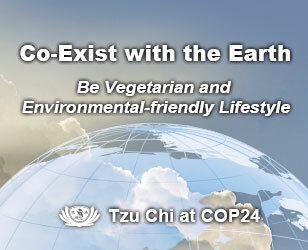 "People in love and no obstacle in life" – that is the characteristic of Tzu Chi's humanism. This warmth winter distribution is the result of the goodness created over many years, an accumulation of blessings.